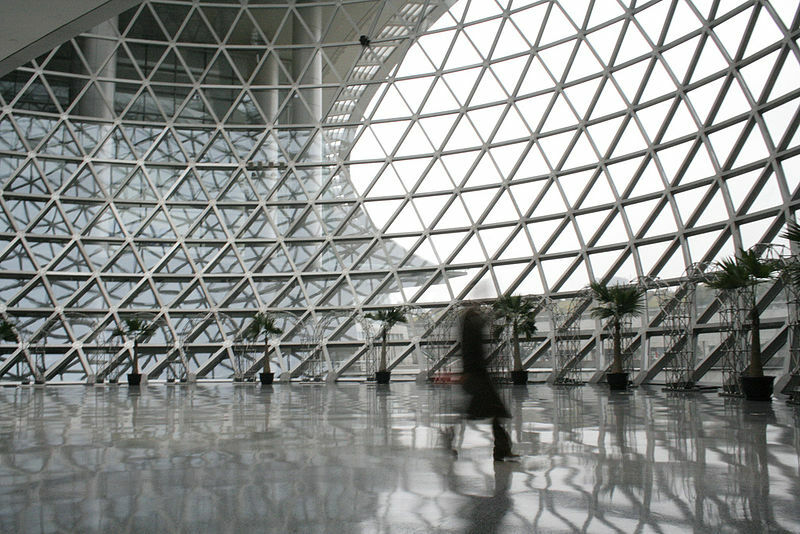 The Shanghai Science and Technology Museum is a large museum located Pudong, Shanghai. It is easily accessible through the Line 2 Shanghai Metro or by a short taxi ride from the Concordia district. According to a student conducted survey, around 18.5% of the students in Concordia like to go spend their time in the Shanghai Science and Technology Museum. The design of the museum is managed by Shanghai-based Creative Star Digital, who planned it to accommodate 2-3 million visitors per year. It covers an area of 68,000 square meters, a floor space of 98,000 square meters, and an exhibition space of 65,500 square meters. It has a peak capacity of 2,000,000 to 3,000,000 visitors per year! The main three themes of the museum are “Nature, Mankind, and Technology”. Different branches and exhibition spaces explore different parts of the theme. It has 14 main permanent exhibitions and 4 science-themed cinemas. Unique exhibitions include: World of Animals, Spectrum of Life, Spider Exhibition, Earth Exploration, Cradle of Designers, Children's Science Land, Light of Wisdom, Home on Earth, Information Era, World of Robots, Light of Exploration, Human and Health, and Space Navigation. Four types of theaters include: IMAX 3D Theater, IMAX Dome Theater, IWERKS Theater, Space Theater. The museum contains a science theater which utilized IMAX screens and could display 2D, 3D, and 4D movies. It constitutes the largest science educational cinema in Asia with 10,000 annual filming times. The Shanghai Oriental Art Center is located near the Shanghai Science and Technology Museum and can be easily reached through the Line 2 Metro. According to a student-conducted survey, around 16 % of the Concordia students enjoy going to the Shanghai Oriental Art Center. The building was designed by French architect Paul Andreu and the Huadong Architectural Design & Research Institute. Backstage facilities include an Orchestra Rehearsal Hall, Choir Rehearsal Hall, Dance Rehearsal Hall, and Integrated Rehearsal Hall. Performance Hall: 333 seats and modeled on semicircular Roman theaters. Note: Exhibition Hall is located on the second floor, usually used to display photographs and artwork. The Oriental Art Center is a famous place that attracts many musicians and performers from across the world. Musicians such as Lang Lang and Yoyo Ma had performed here for multiple times. Local performances have performed here as well as foreign teams. For example, the classical ballet “Swan Lake” has performed here multiple times. Teenagers in Shanghai who enjoy performing arts and music can spend their time in the Oriental Art Center and watch performances for all across the world. The Mercedes-Benz Arena, formerly known as the Shanghai Expo Cultural Center, is an indoor arena located in Pudong. It hosted multiple shows, concerts, and tournaments, including opening ceremony for Expo 2010. According to a student-conducted survey, around 37% of Concordia students enjoy going to this place. The Main Venue of the Arena can hold an astounding18,000 people, the main Venue end-stage 13,000 and the Mixing Room & Muse 800. After 2010, it became the most popular arena for concert tours of performers from China and Hong Kong, Korea, Japan, and the United States, attracting many superstars across the world such as Taylor Swift, Jennifer Lopez, Justin Bieber, Ed Sheeran, and Maroon 5. The Arena could also be used as a sports stadium. For example, an NHL pre-season game on September 21st, 2017, was held in the stadium, with a crowd of 10,088 gathering to watch the first ever game played in Shanghai, China. It can also hold electronic sports contests. In March 2016, a professional Dota 2 video game tournament, Shanghai Major 2016, was held in the Mercedes Benz Arena. In 2017, a Victoria’s Secret show was held there for the first time. Attracting thousands, the Mercedes Benz Arena is a popular choice among teens. It also includes an ice-skating rink and rock climbing wall. Below is the website link to the Mercedes Benz Arena.